iOS system recovery lets you fix your iOS back to normal by yourself at home. With this iOS Repair software, you can easily fix any kinds of iOS system issues and get your device back to normal. Mostly importantly, you can handle it by yourself within less than 10 minutes, and won't lose anything during the whole repairing process. You may delete some important data by mistake, or just encounter system crash and unexpected virus. In such cases, Mac iPhone Data Recovery will help you to get them all back. 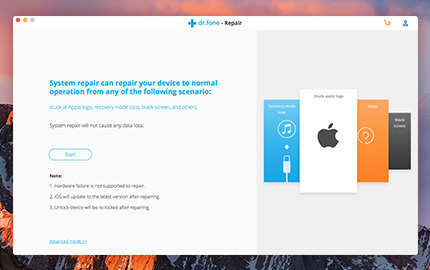 Unlike iTunes or iCoud restore, this iOS Repair software won't change any data on your device. When it gets back to normal. Everything remains. Comparing to iTunes restore or other methods that can fix your iOS system issue, using iOS Repair won't put you at risk of losing data and settings on your iPhone, iPad or iPod touch. All you need to do is getting your device connected and move forward with a few clicks. Then everything will get done within a few minutes. Nothing on your device is lost or changed. This is the magic that iOS Repair does.